Vegan camping may seem tricky to some. People always ask, “What do vegans eat? Is it only salad?” The idea of vegan camping and meal planning can feel like a tall order, but it’s actually very simple! Plus there is the added bonus of not worrying about keeping meat or dairy at safe temperatures. You can throw everything in a cooler and large grocery bag and call it a day. 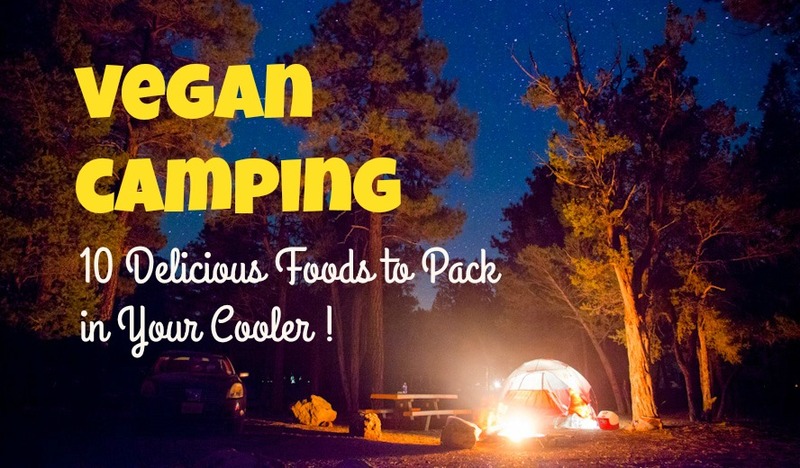 Here are the top 10 things to pack for a vegan camping trip! We recommend bringing a balance of fresh food along with canned or store bought items. Some of the recipes shared below can be made ahead of time or even frozen for quick, easy meals throughout your trip. No vegan camping trip would be complete without hummus. We’ve included our recipe for Parsley Hummus (so green, so tasty!) but store bought hummus is also good if you’re short on time. Pack some chips and fresh veggies to eat with your hummus. It also makes an excellent spread for sandwiches! Find the recipe for our green parsley hummus below. Whisk together or blend the milk, cacao, and sweetener until evenly combined. Stir in the chia seeds and refrigerate for 4 hours or overnight. This is one of my all time favorite recipes ever. I’ve made it for vegan camping trips in the past and it stays delicious for DAYS! Not sure how many days exactly, we always end up eating it all by day three or four. This recipe is savory, satisfying, and can be made and frozen ahead of time. This way it will stay fresh longer and keep your cooler colder! Find the recipe below! In terms of store bought items, there is almost nothing more satisfying on a vegan camping trip than a few slices of pan fried polenta topped with vegan chili. You can pan sear the polenta ahead of time and leave it in the cooler. Alone it makes an excellent snack. Topped with vegan chili it is next level awesomeness! The polenta and chili don’t even need to be warm to taste good, so if you are at a festival with no access to a camp fire or stove, this is still a fantastic dinner option. Try sprinkling the polenta with nutritional yeast, sea salt, and cracked pepper before you pan fry it. It’s so good! We used a small amount of coconut oil spray for this polenta. Speaking of tortilla chips, don’t forget to pack some along with a jar of salsa. This makes a quick salty snack that will balance your sodium levels when it’s hot outside. Ok let’s talk about this baked tofu. It tastes soooooo good and the best part? It’s comes in a vacuum sealed package so you can throw this in the bottom of the cooler and forget about it until you’re ready for sandwiches! We like sprouted grain bread. It’s a much healthier option than traditional bread and it seems to stay fresh longer as well. Spread a dollop of hummus or mustard on your sandwich with some fresh produce. You can also chop up the baked tofu and throw it on top of a salad or quinoa tabouli. YUM! No vegan camping trip would be complete without an assortment of fresh vegetables. We like to bring pepper, cucumbers, and cherry tomatoes to eat with our hummus or throw into a big salad. A bag of spring mix is good to eat on day one or two of your trip, before it begins to wilt. Don’t forget to pack a small cutting board and kitchen knife! It’s always a good idea to have an assortment of snacks for your vegan camping trip. We like to bring energy bars for protein and fiber, and non-dairy yogurt to eat with berries for a simple breakfast. Dill pickles are delicious to eat alongside a sandwich, or alone for a crisp, salty snack. Avocados OF COURSE! Eat them straight out of the peel with a spoon, add a few slices to your sandwich or salad, use it as a chili topping, there are so many options! Coconut water is a great beverage to have on hand. It will replenish your electrolytes and rehydrate you faster than regular water. Plus it tastes good, so throw some in your cooler! Saving the best for last, let’s talk about fruit! Oranges and grapefruits make excellent vegan camping choices. Berries are terrific snacks and will also be really good on top of your chocolate chia pudding. Bananas, because obviously. The watermelon and pineapple are SO REFRESHING to cut up and share on hot days.